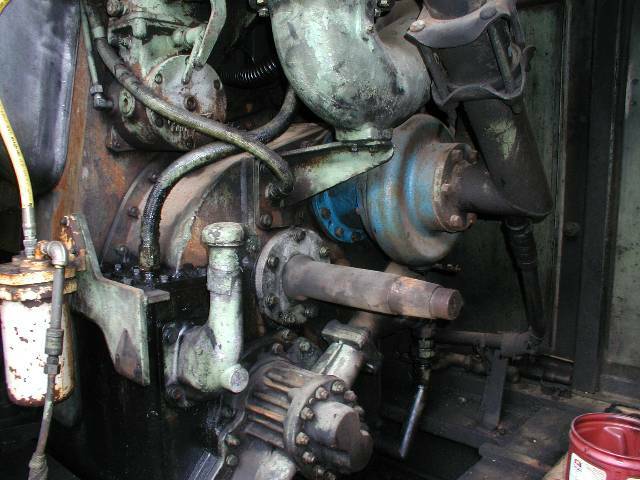 The air compressor on most locomotives is driven directly by the diesel engine. 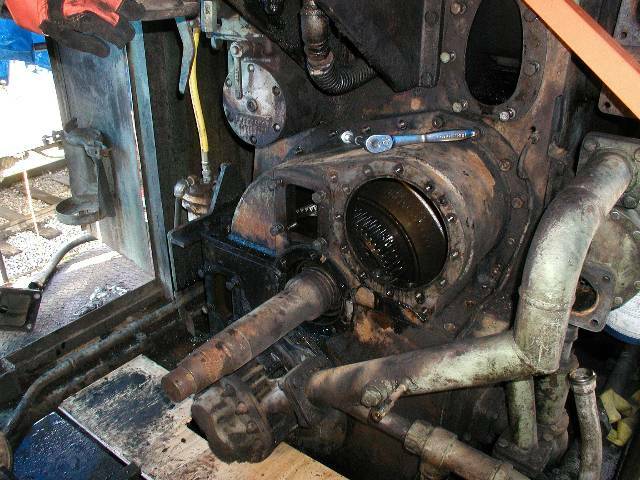 The Alco 251 engine has a "extension shaft" bolted to the front end of the engine crankshaft. 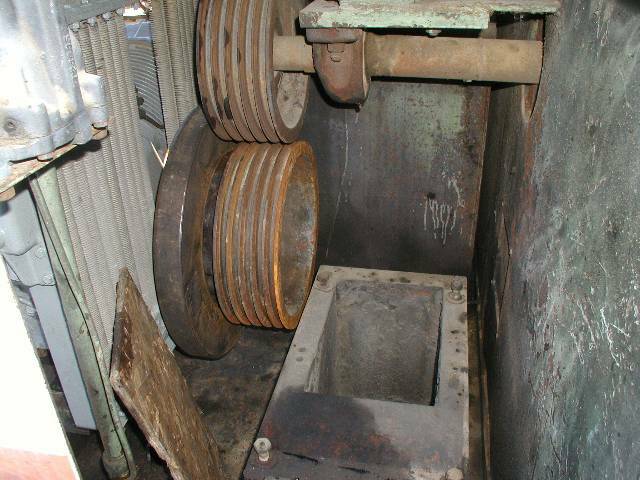 The extension shaft has a coupling on its end known as a Fasts coupling. 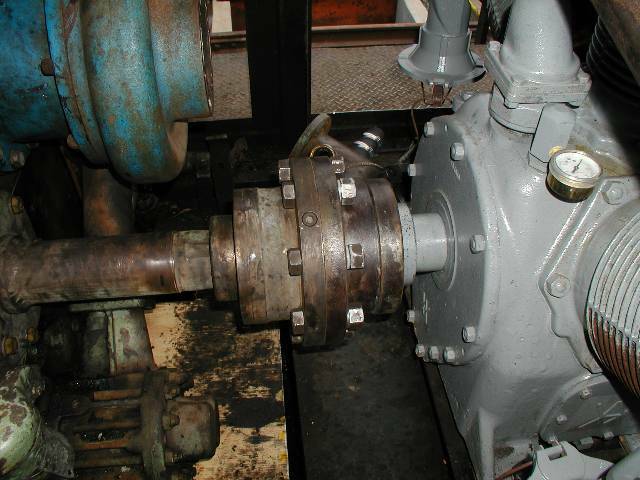 Half the coupling is attached to the extension shaft and the other half to the compressor crankshaft. 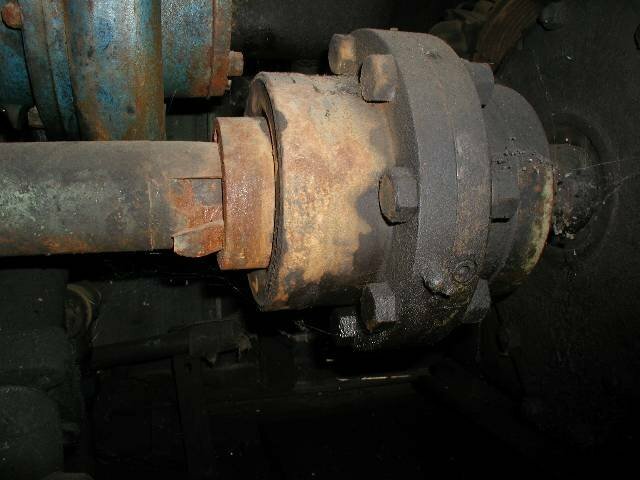 This coupling between the engine and the compressor was severely damaged on the 1218 and both the extension shaft and the compressor crankshaft were nearly destroyed. It appears that the compressor was removed for some reason and its coupling half was not properly installed after the compressor was repaired. 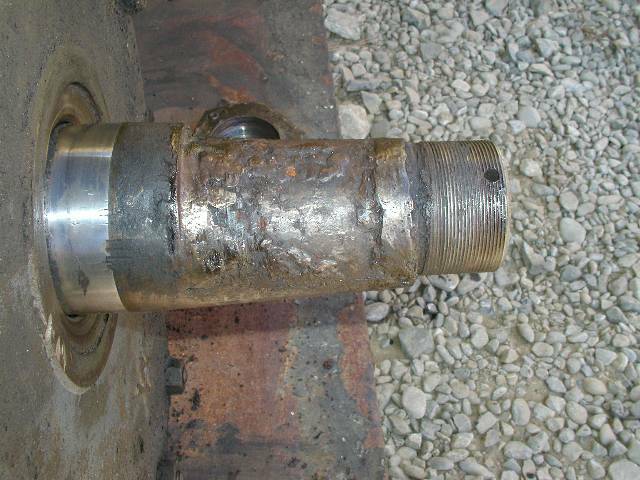 The coupling came loose and the shaft was "repaired" by the application of some really ugly weld. The coupling was put back together and ran that way for some time when the coupling came loose on both the compressor and the extension shaft. 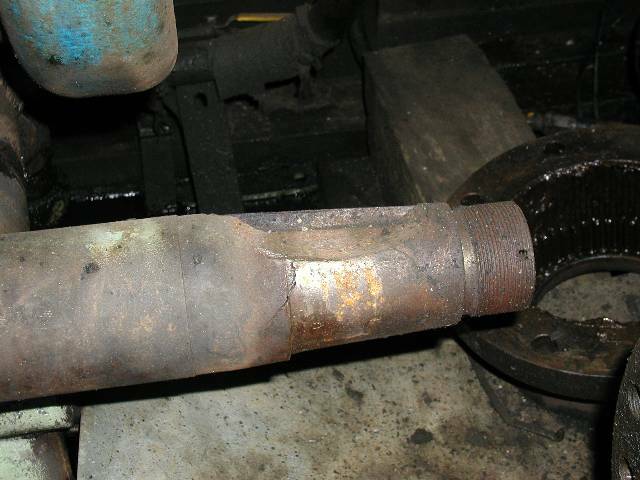 When we got the 1218, the coupling was only barely holding together and we knew that a significant repair would have to be made. The little piece of metal sticking out of the left side of the coupling in this photo is a hunk of the crankshaft extension that was torn loose by the force of the key banging around in its key way. 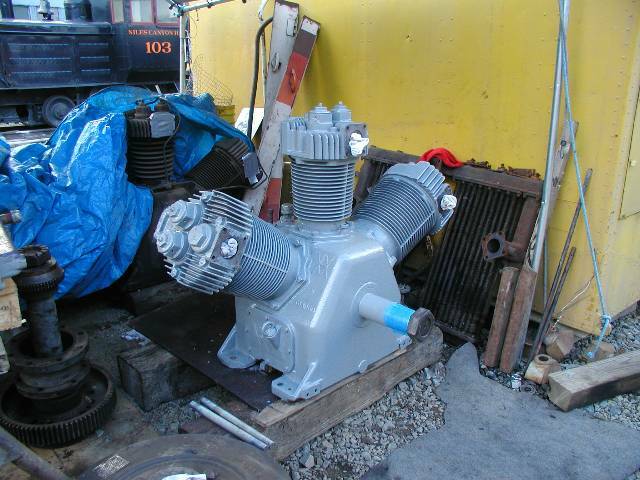 As far as repairing the damage to the compressor and the engine crankshaft is concerned, we had several options. They could be built up with metal and turned down in a lathe and this is the path we though we would have to take. 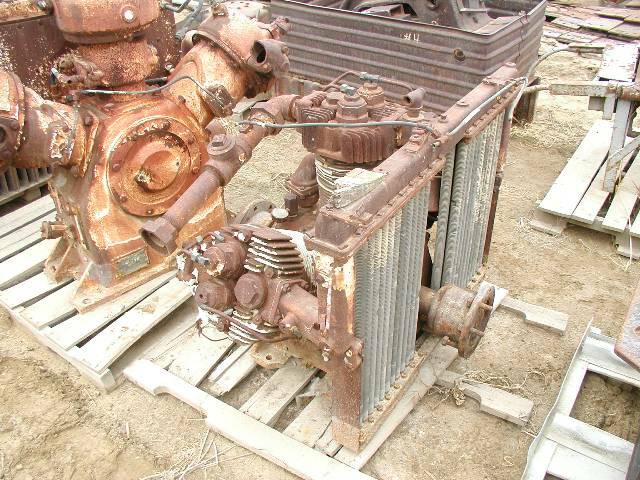 We elected to pull the compressor and get bids on the work. 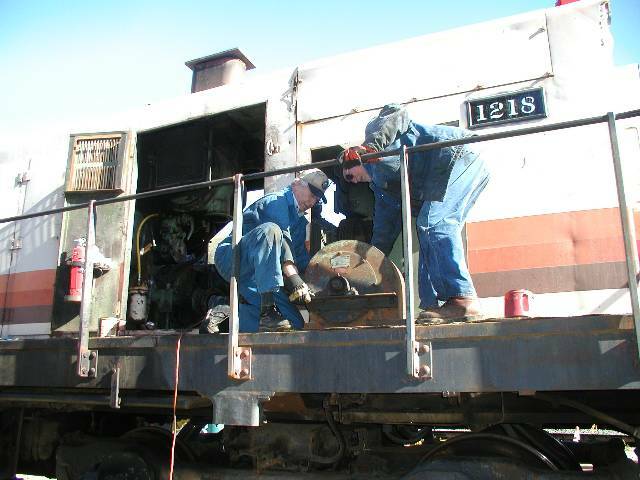 There are no photos of the process of pulling the compressor out of the 1218. The only one I caught is of it after it was removed. 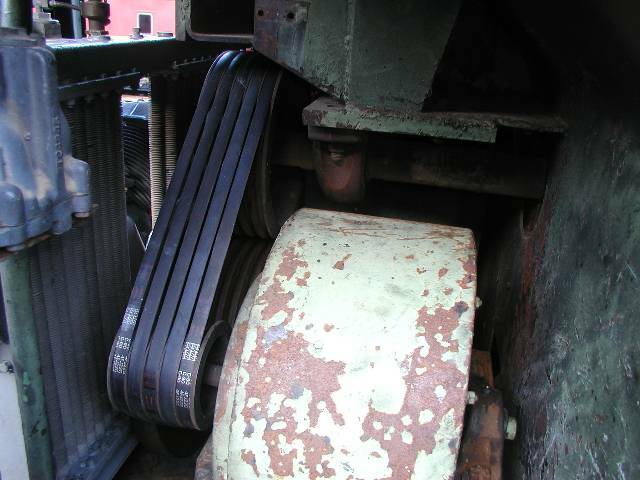 Photo #2 is of the pad where the compressor sits, #3 is of the damaged compressor crankshaft. 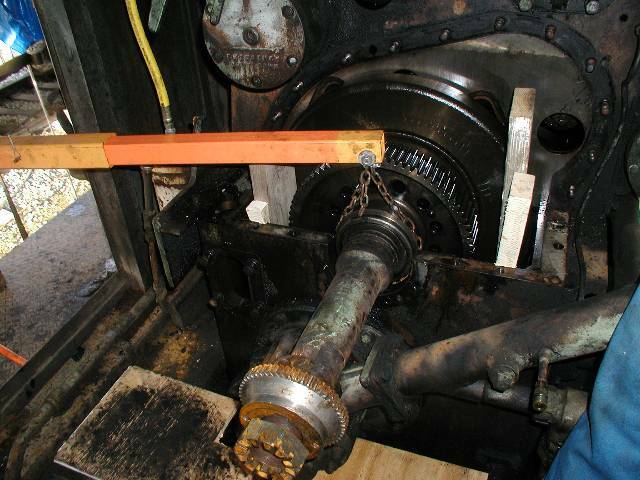 #4 and #5 are of the end of the engine crankshaft extension. I got an email from a fellow who was involved in the scrapping of an S6. He told me that he had been contacted by author and Southern Pacific historian Joe Strapac and told that we may be in need of some parts. 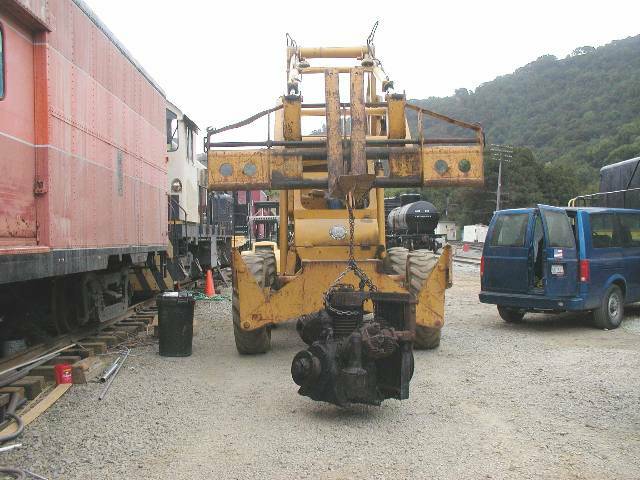 When I saw a photo of various engine parts on a pallet, including the extension shaft, I about had a cow and immediately told him that we were interested in the shaft. To say that this was a blessing would be putting it mildly. 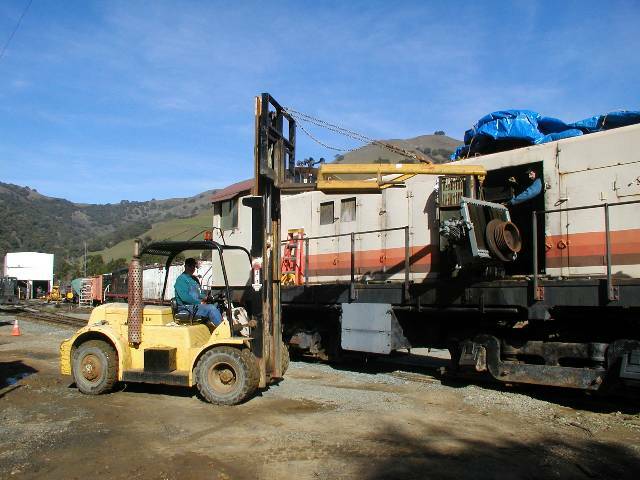 A purchase was quickly arranged and the little jewel came home to Niles Canyon. The acquisition of this shaft eliminated half of our coupling problem. 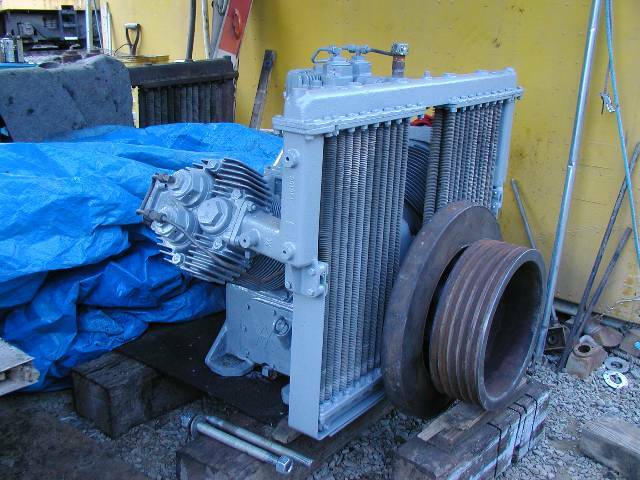 One day, I was talking with a friend who told me that he knew of a compressor from a scrapped Alco MRS1 (a military 6 axle locomotive). So Jon, Rich and I took a little trip to have a look. 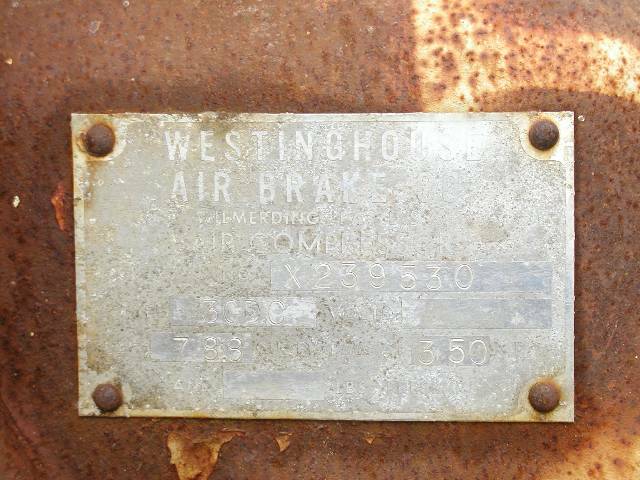 What we found was a Westinghouse model 3CDC. 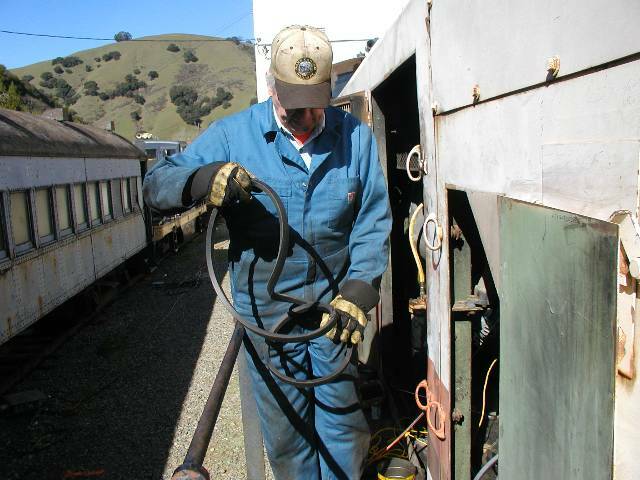 Except for some piping and the coupling on one end of the crankshaft, it was exactly what we needed for the 1218. 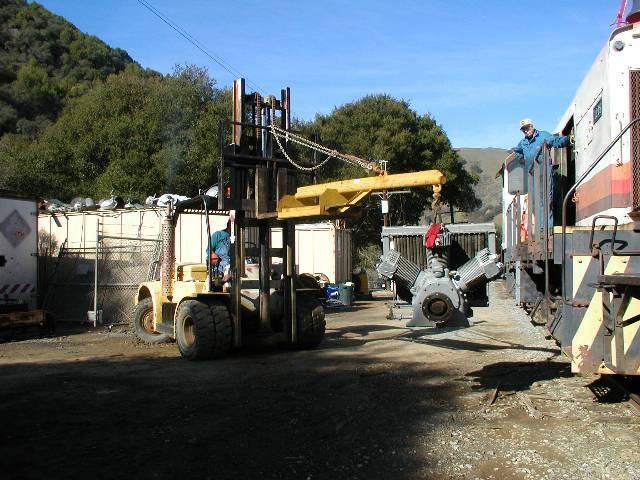 After arrival at Niles Canyon, we proceeded to pull one of the couplings off. 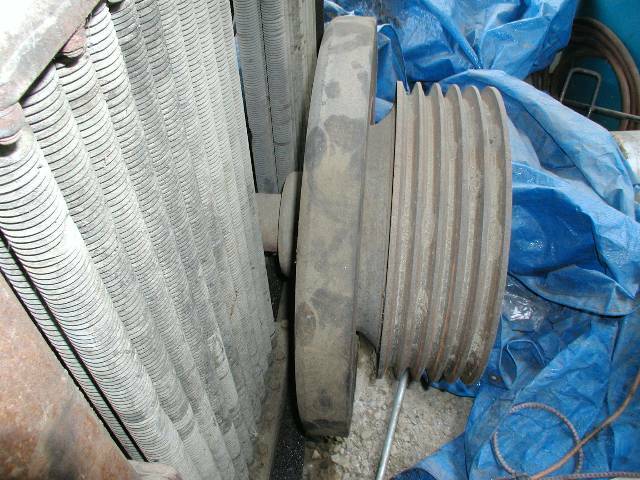 The other coupling was a Fasts, just like the one on the old compressor. And here are both the shaft and the new compressor sitting side by side. We were certainly excited about getting these parts! 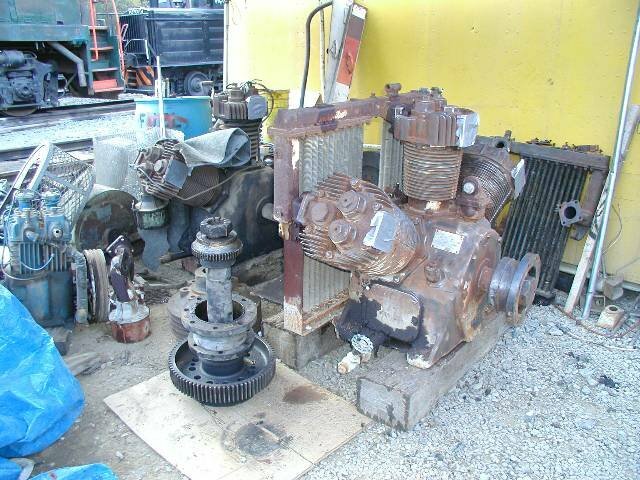 We removed the pulley and damper from the crank of the old compressor, cleaned up the new shaft and compressor, put the pulley on the new compressor and were ready to install the new parts. 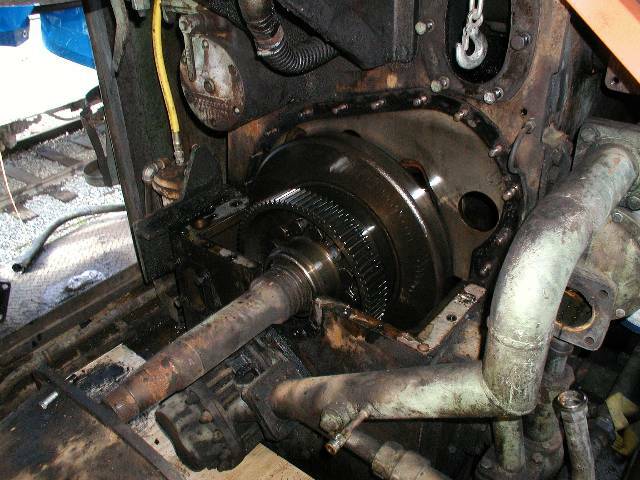 It was unknown if the crankshaft extension shaft could be removed from the engine without pulling the crankshaft, an operation that we could not undertake. 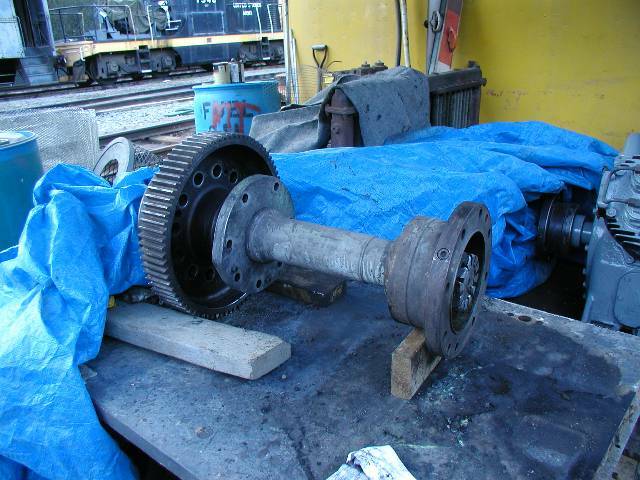 If the shaft would not come out, it would have to be repaired in place and we would use the new coupling we got with the shaft from the scrapped locomotive. 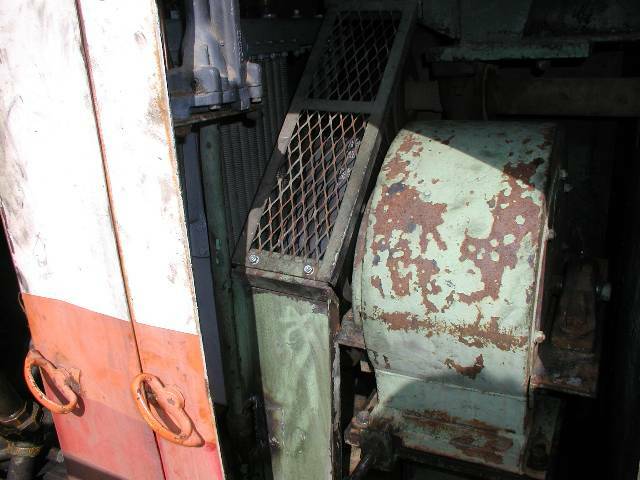 The Alco 244 and 251 engines are very similar. The 244 service manual gives instructions on how to pull the extension shaft but the 251 manual does not even mention the process. After much agonizing, measuring, calculating and more agonizing, I decided that it would come out. 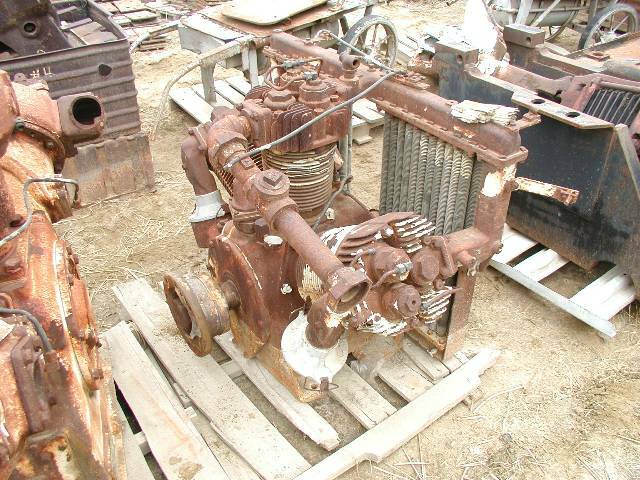 The process would involve removing some water piping, the water pump, the turbocharger outlet pipe and the front end gear cover. Photo #1 is the old shaft in place. 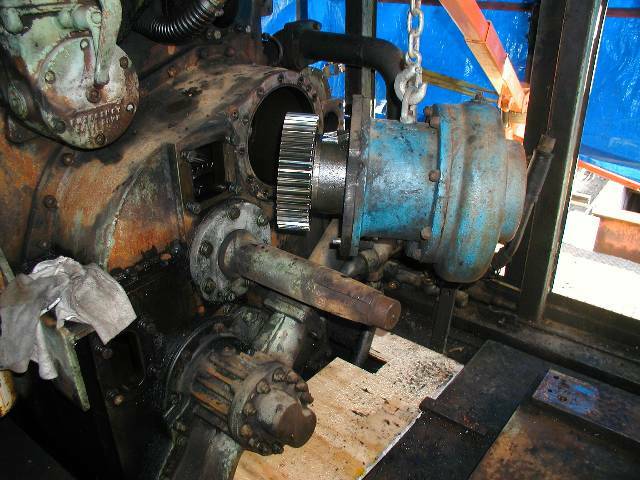 Photos #2 and #3 are removing the 295 pound water pump. With the piping and the water pump out of the way, we could attack the gear cover. 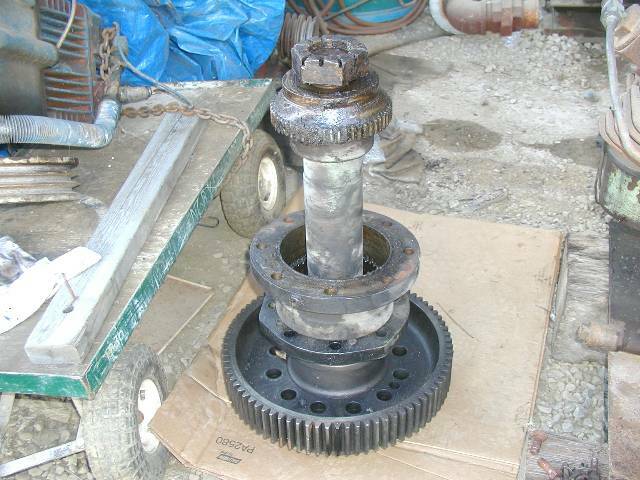 Once it was removed, the rest of the shaft and its gear were exposed. At this point, we could see that the shaft would indeed come out this way. 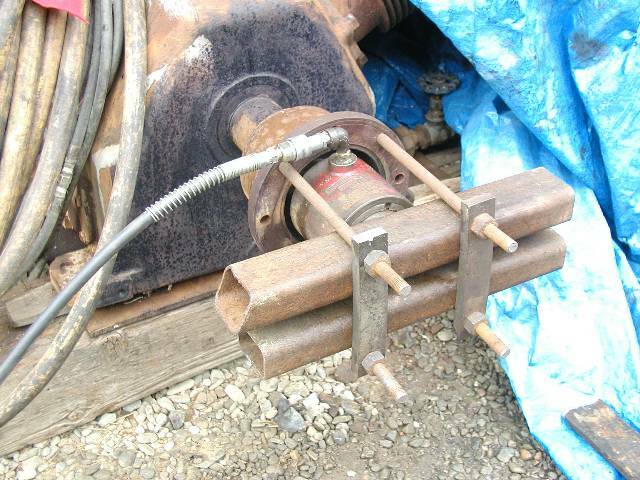 We rigged our small hydraulic crane to the shaft and pulled the dozen 7/8" bolts, after blocking the crankshaft vibration damper with wooden wedges. Once the bolts were out, there was nothing hold the damper on and if it fell of the crankshaft, we would have a real problem on our hands. With some gentle persuasion, the old shaft came out quite easily. 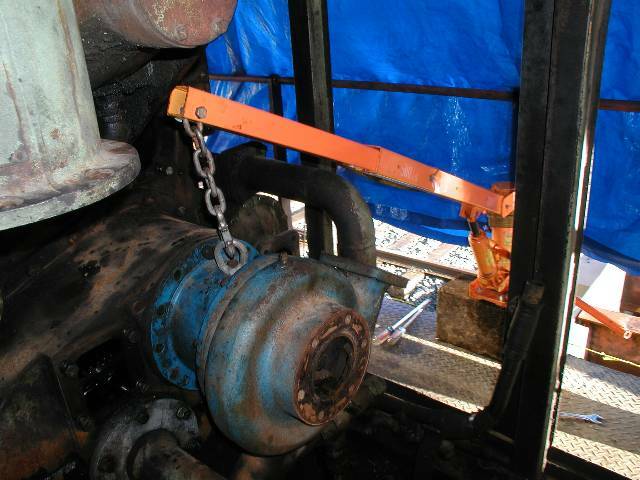 The replacement shaft was rigged in the same manner and carefully positioned into its new home. The numbers painted on the bolt heads are the sequence numbers for the tightening pattern. 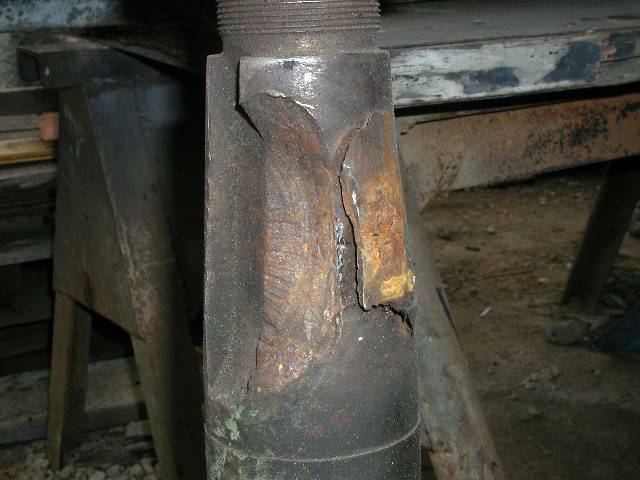 It is critical that the shaft bolts be tightened evenly so that the shaft will not wobble at the coupling end. This wobble is called "runout" and cannot exceed .006" (6 1000's of an inch). 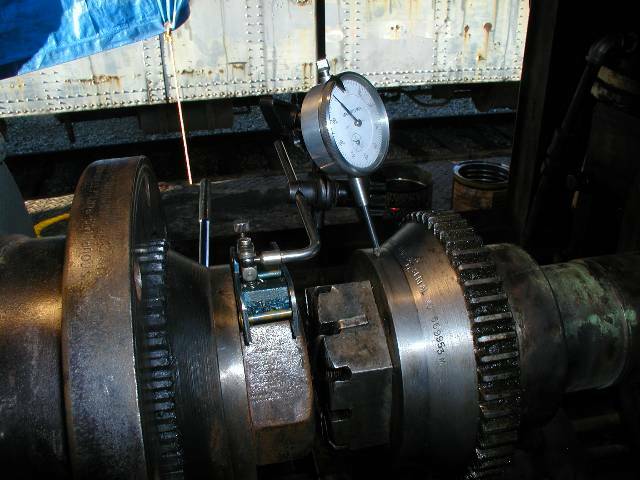 When we measured the runout after torquing the bolts to 450 foot pounds, the runout measured a very nice .002". After this, the cover went on and the pump went back in. Next on the agenda was putting the new compressor in. It weights roughly 1500 pounds so some care was required. With Jon on the forklift and Rich and I guiding the compressor, the job was quickly done. 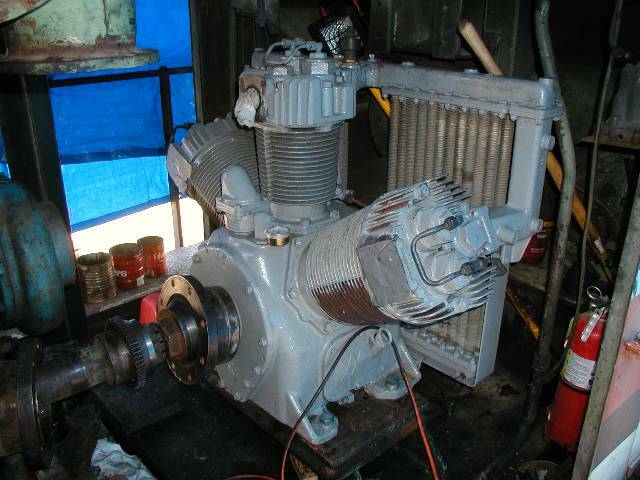 The compressor and the engine crankshaft have to be carefully aligned, both horizontally and vertically. 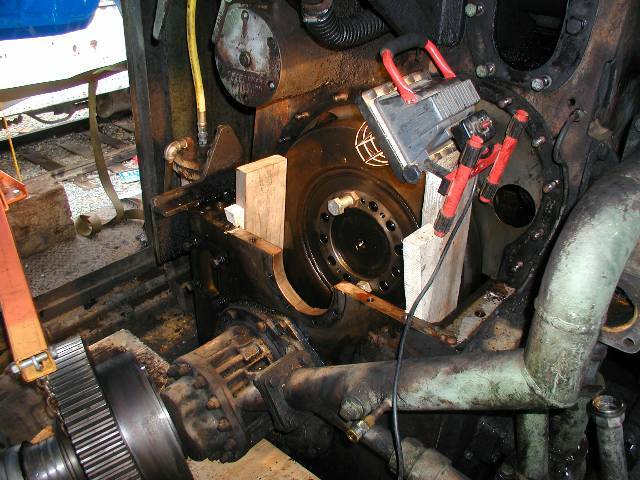 Photo #2 shows a dial indicator attached to a magnetic base which is sitting on the nut of the compressor shaft. 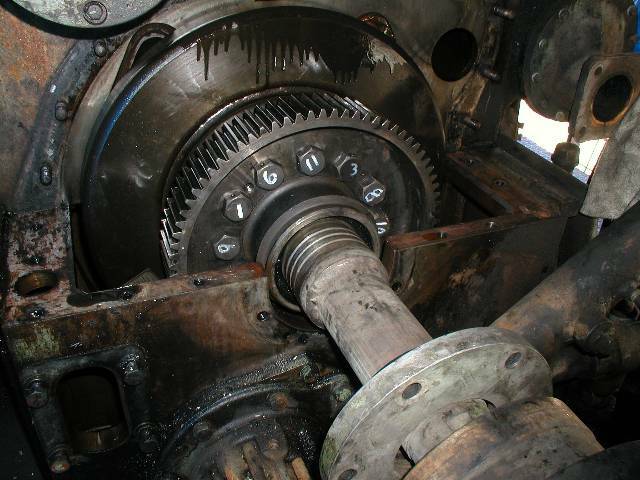 The indicator shaft is resting against the hub of the engine crankshaft coupling. By rotating the compressor, we can read the offset between the two shafts. Photo 3 illustrates the taking of the measurement that indicates if the shafts are operating in the same plane. 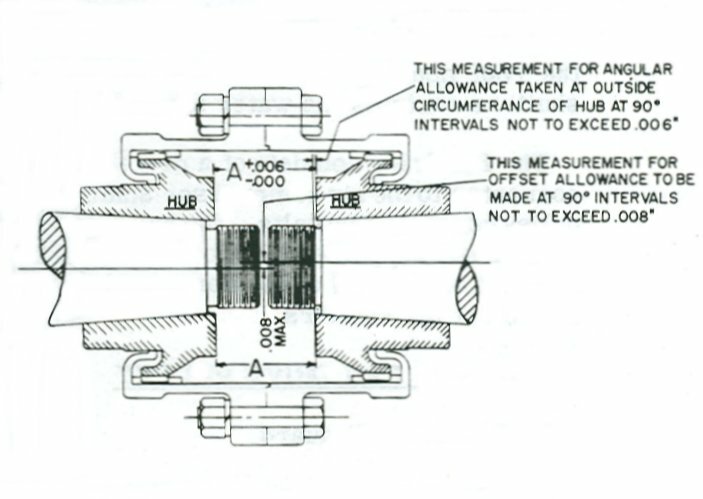 The difference between this measurement and another taken 180 degrees around the coupling faces can be a maximum of only .006". 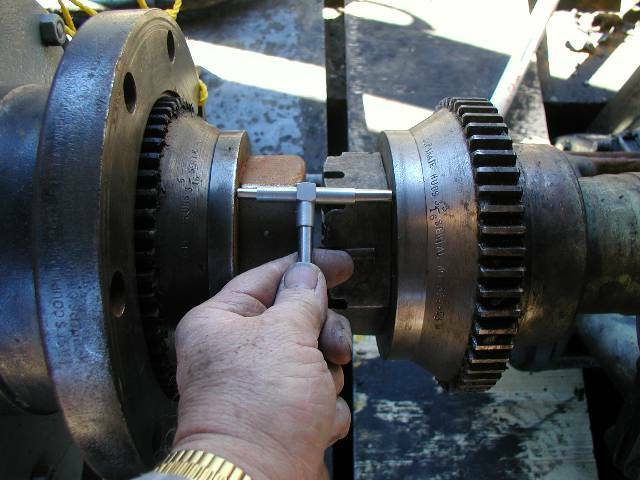 These are only a couple of the measurements to be made during the process of alignment. Changes to the alignment are made by putting steel shims under the compressor mounting feet and moving the compressor around on its mounting pad. Photo #1 illustrates the top of the front traction motor cooling air duct where the blower resides. 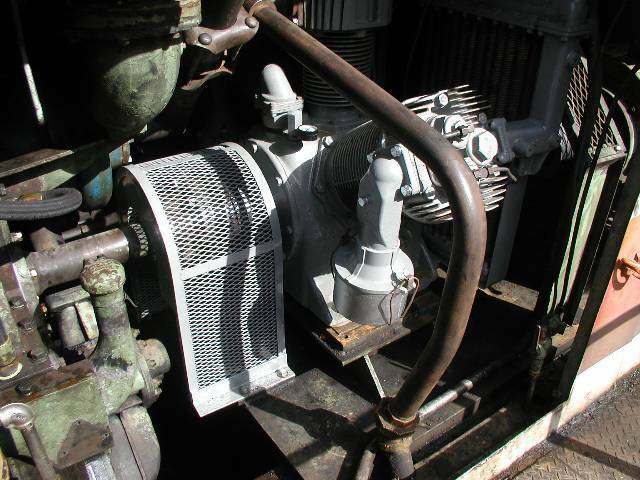 The lower pulley is on the front of the compressor and the upper is on the engine cooling fan shaft. The pulley on the front end of the air compressor drives both the blower and the engine cooling fan. Jon and Rich are getting ready to muscle the blower back in its location and Rich is seen uncoiling one of the 5 fan belts. At last, all the belts are on and correctly tightened. The protective coverings for the belts was then added. 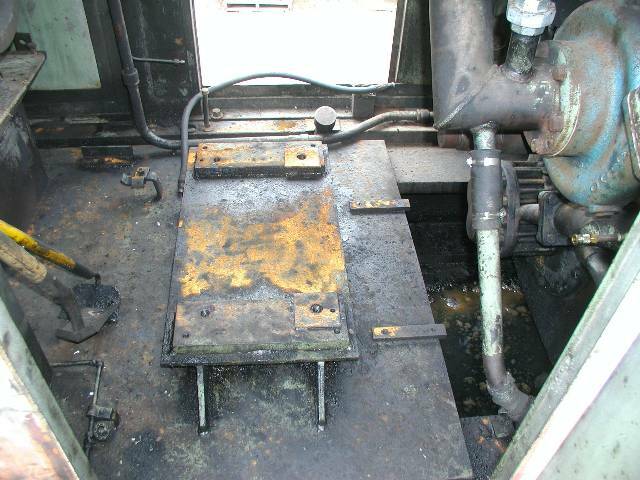 The final operations were to put all the various pipes back on the engine, connect and lubricate the coupling and then install the protective shield over the coupling and shafts.